Top genealogists Elissa Scalise Powell, Judy G. Russell, Elizabeth Shown Mills, and Stefani Evans will present six lectures at the Family History Library’s Floor B2 classroom in Salt Lake City Saturday, October 11, between 9:00 am and 4:45 pm. 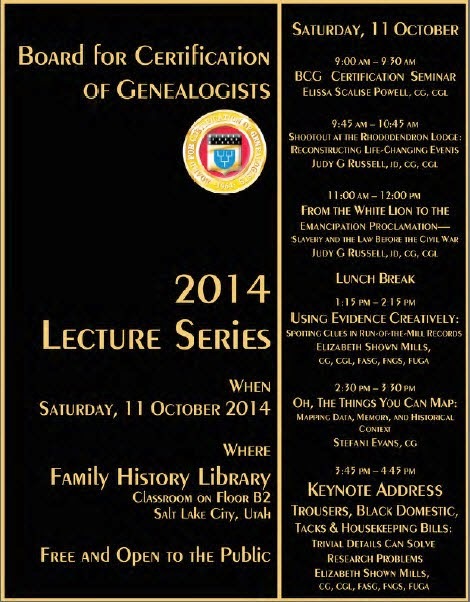 The lectures are free and open to the public, sponsored by the Board for Certification of Genealogists. The board is an independent certifying body and author of the updated 2014 Genealogy Standards. I was excited to receive this press release announcing that the Association of Professional Genealogists will give a discount to those under 25 who are are interested in professional genealogy. This is a great way to encourage younger genealogists to attend the conference, which in turn may help to boost their career. WHEAT RIDGE, Colo., 26 September 2014 −The Association of Professional Genealogists (APG®) today demonstrated its commitment to next-generation genealogists by offering young professionals a significant discount to APG’s Professional Management Conference (PMC). The Young Professional discount offers savings of 40 percent off the full price of the conference, with additional discounts for single days. The conference, themed “Professional-Grade Genealogy,” will be held the 8–9 January 2015 at the Hilton Hotel in downtown Salt Lake City, Utah. Registration is now open for the 2015 PMC at www.apgen.org/conferences. The 2015 PMC is two full days and will feature 14 speakers teaching 16 sessions (including four hands-on workshops) on key topics for professional genealogists. These include DNA, time management, genealogical standards, citation writing, having difficult conversations, setting fees, adoption research, and professional writing and speaking. PMC is the only genealogical conference focused on providing professional genealogists with opportunities for networking, advanced education, and professional and business development. New in 2015, PMC Poster Sessions offer exciting and unique networking opportunities by providing professional genealogists with an informal, interactive opportunity to showcase research, share work, and exchange ideas. PMC will also feature the annual APG member meeting and the APG reception, the latter to be held Friday night. On Thursday, 8 January 2015, FamilySearch is helping pay for lunch—making the plated lunch only $10. David Rencher, Chief Genealogical Officer at FamilySearch, will present "Do Online Trees Have a Place in the Professional Genealogists’ Toolkit?" Visit www.apgen.org/conferences for full conference details and to register for PMC 2015. Young Professional pricing ends 15 November 2014. The Young Professional discount is available to APG members and non-members who are age 25 or younger. Attendees may choose to attend the full conference or a single day. Details on pricing and the conference sessions are available at www.apgen.org/conferences. The Association of Professional Genealogists (www.apgen.org), established in 1979, represents more than 2,700 genealogists, librarians, writers, editors, historians, instructors, booksellers, publishers and others involved in genealogy-related businesses. APG encourages genealogical excellence, ethical practice, mentoring and education. The organization also supports the preservation and accessibility of records useful to the fields of genealogy and history. Its members represent all fifty states, Canada and thirty other countries. APG is active on LinkedIn, Twitter (www.twitter.com/apggenealogy) and Facebook (www.facebook.com/AssociationofProfessionalGenealogists). I had a great time visiting the Carroll County Genealogical Society this last Monday and giving a presentation on "Becoming a Census Detective." I was asked there about my upcoming speaking engagements, and when I was featured on the "Forget Me Not Hour" with Jane Wilcox at Blog Talk Radio today I was asked the same question, so I will post my speaking schedule here. "Studying Genealogy: A Personalized Approach"
To “study” genealogy one must go beyond casually attending presentations and work to learn about specific topics. Each genealogist has a unique background and experience and thus has differing educational needs. This presentation will focus on strategies for learning about sources and methods and will show you how to locate resources to study the topics you need to enhance your research. Census records are an essential resource for genealogists. This session will focus on going beyond basic use of the census and assist participants in understanding the pre-1850 census records; discovering how the non-population schedules can enhance research; locating and using state census records; and evaluating information from every census column to maximize the information gleaned from the record. How full is your toolbox? Does it include creating spreadsheets, charts and timelines to compare and evaluate research findings? Would you like to add skills such as separating individuals of the same name, researching extended family and associates of an individual, and using identity characteristics to locate or identify a person? The session will highlight these techniques and conclude with a case study that employs many of the methods to demonstrate their use in a real genealogical problem. "Mining for Family History in Federal Land Records"
Did your ancestor have a homestead or buy land on the frontier? Come learn about the federal land entry papers at the National Archives and the genealogical information they provide. Time Management: Successfully Balancing the Demands of Our Many "Clients"
As professional genealogists we strive to work efficiently and manage our time effectively. We balance a variety of demands such as client research, writing projects, volunteer positions, lecture opportunities, continuing education, and administrative tasks. This session will address ideas for managing your workload, scheduling projects, prioritizing tasks, tracking your time, and staying focused. This hands-on course is an opportunity for advanced genealogists to put their research skills into practice. Participants will work on five complex genealogical research problems—a new one each day. The objective is to give each student experience in conducting research on complex problems, analyzing and correlating evidence, and reaching conclusions. The research problems will be varied, offering students the challenge of stretching their mind and skills in directions that their research may not normally take them. If you can't resist a genealogical challenge and love hands-on learning, then this is the course for you! I will post additional speaking engagements for 2015 at the beginning of the year, but I am looking forward to speaking in Maryland, Virginia, Utah and Washington! Have you considered participating in the ProGen Study Program studying the manual Professional Genealogy? For this week's Follow Friday post I would like to share some posts written by recent alumni of the program. They share their experiences and their advice for others who may want to join one of these study groups. The ProGen Study Groups were also featured on the Genealogy Professional Podcast with Marian Pierre-Louis. You can listen to the episode here.